Rosie and I first met when she took watercolor lessons from me many years ago. At one point she appeared in class with a handful of small handmade papers she had made in a workshop. The look on her face was priceless, like someone had given her a fabulous gift. 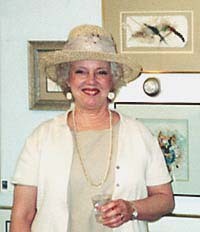 In fact, Someone had: Rosie began to explore the art of papermaking and found her true joy in making art and teaching. Q. Were you an artist before you became a papermaker? A. No, papermaking opened the door for me to pursue my career. In the beginning I could not think of myself as an artist. I believed artists were a select few and in my mind the thought of being an artist was unattainable and very intimidating. Q. How did you begin, after that first experience, to learn your art of papermaking? A. I began to learn the art of papermaking by researching material, studying people who were instrumental in the renaissance of papermaking. I attended workshops conducted by experts in the field. When I first started making paper I experimented by stirring pulp on the stove. My children would come home from school and ask, "What's for dinner, Mom?" I would respond, "Today we are having black bark soup!" I conjured up "magical stews" and made pulp from iris leaves, cabbage, lettuce, hay, grasses and anything else I could cook up. Q. Who or what had the greatest influence on you as you developed as an artist? A. The Japanese culture influenced me and continues to today. In Japan, paper is pronounced gami and means God. The Japanese have a spiritual connection with paper and utilize it in many ways from prayerful rituals to shoji screens. Paper is an invitation to look within and discern my own emotional response to such humble material. I now teach workshops titled "The Zen of Handmade Paper." I am writing a book about my own Zen experience with paper. Q. What is it about paper that fascinates you so? A. Handmade paper is a metaphor for my own spiritual journey. It is a reflection of how I see myself. I take a common ordinary raw material and transform it into something magnificent. Q. Have you had any unusual experiences during your career as a paper artist? A. Yes. I was awarded Best of Show in the first art show I entered. This was the beginning of a wonderful journey with paper. For several years I made income on my designs. In my area I pioneered the education of handmade paper by teaching and demonstrating in schools and art centers. My paper trail has taken me to Hawaii and Japan, where I studied with Japanese papermakers and, during a 2,000-mile tour, visited several villages where handmade paper is still made today. One of my pieces won an Honorable Mention in a show in Japan. Q. 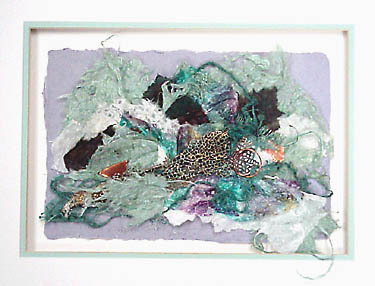 In what ways do you create art pieces from your handmade paper? A. I have made paper garments, purses, jewelry, books, stationery, ornaments and original handmade paper designs. I also make wedding invitations and wedding memorabilia, such as church programs and gift items. Do you combine any other media with paper? A. For over 15 years I have been a purist: It could only be my handmade paper. Now I am experimenting with incorporating other papers and collage materials in my work. I have been using watercolor on my paper, as well. What advice do you give your students in pursuing the art of papermaking? A. On a practical level I advise them to acquire as much skill and knowledge as possible. Anyone is capable of doing this. But if they want to delve into deeper understanding and realize why they are pursuing this art, I tell them to pay attention to the signs along the way and to know that their thoughts and feelings are the creative forces in the universe. Keeping a journal about your many thoughts and feelings is an excellent way to be in touch with your creative endeavors. Paper has many alluring qualities. Pay attention and be aware of its process as you travel its path. The art of making handmade paper has the capability of drawing from you the beautiful aspects of your own inner beauty and dignity. Rosie's work may be seen at Town & Country Fine Art Center in Kettering, Ohio.